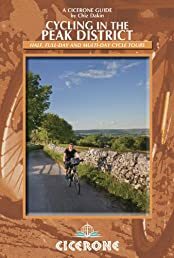 Guide to cycling in and around the Peak District National Park, on road or trail bike. 20 day routes and one multi-day cycle Tour of the Peak District. All easily accessible from Sheffield, Huddersfield, Manchester and Stoke-on-Trent. Routes from Ashbourne, Matlock, Bakewell, Buxton and many other charming Derbyshire towns right across the park on quiet roads and off-road trails. All graded from Easy to Hard according to a combination of distance, gradient, terrain and ascent. The Peak District is now becoming a popular cycling destination with its network of quiet lanes, gentle off-road trails and stunning upland views just right for two-wheeled exploration. All the routes are described in detail, with information about nearby refreshments, cycle hire, public transport and parking, and illustrated with OS maps and route profiles. Appendices cover cycle hire outlets, car parks and public transport in detail as well as outlining a basic tooklist and basic tips on bike maintenance and repairs.